Gochujang is a savory and pungent fermented Korean condiment. Traditionally, it has been naturally fermented over years in large earthen pots outdoors, more often on an elevated stone platform, called jangdokdae in the backyard. Left: A jar of gochujang made with chili pepper powder, doenjang (Korean soybean paste), and glutinous rice flour. Gochujang's primary ingredients are red chili powder, glutinous rice powder mixed with powdered fermented soybeans, and salt. Major substitutes for the main ingredient, glutinous rice, include normal short-grain rice, and barley, and less frequently, whole wheat kernels, jujubes, pumpkin, and sweet potato; these ingredients are used to make specialty variations. A small amount of sweetener such as sugar, syrup, or honey is also sometimes added. It is a dark, reddish paste with a rich, piquant flavour. It has been made at home in Korea since the 16th century, after chili peppers were first introduced. The making of gochujang at home began tapering off when commercial production started in the early 1970s and came into the mass market. Now, homemade gochujang can hardly be found. 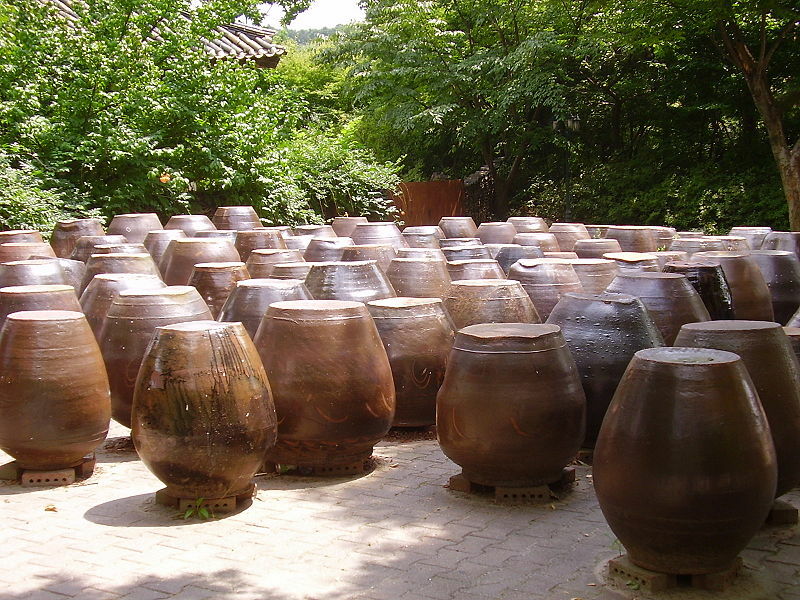 Left: Traditional earthen jars used for aging gochujang and kimchi. It is used extensively in Korean cooking, to flavour stews (jjigae) such as gochujang jjigae, marinate meat such as gochujang bulgogi, and as a condiment for naengmyeon and bibimbap. Gochujang is also used as a base for making other condiments like chogochujang and ssamjang. Chogochujang is a variant of gochujang made from gochujang with added vinegar and other seasonings like sugar and sesame seeds. It is usually used as a sauce for hoe and hoedeopbap. Meantime, ssamjang is a mixture of mainly gochujang and doenjang, with chopped onions and other spicy seasonings, and is popular with sangchissahm, which is a lettuce wrap of marinated, grilled meat with sliced garlic and green chili peppers. 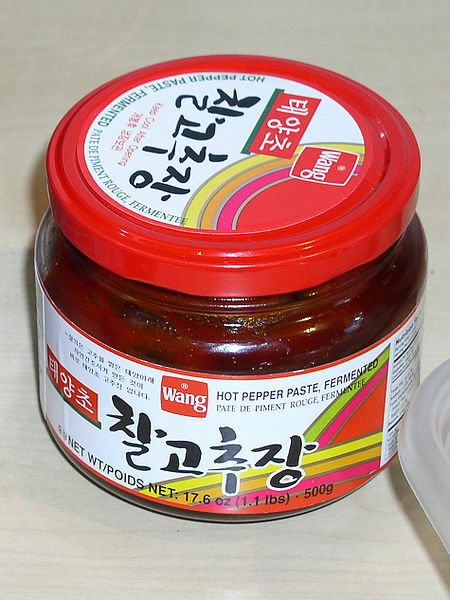 Gochujang is largely recommended to add to Korean food, especially bibimbap and tteokbokki. Gochujang plays a role in food, making dishes spicier, but also somewhat more sweet.